KEY CONCEPT: Counting and Addition. 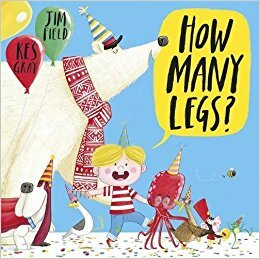 DESCRIPTION FROM THE PUBLISHER: From the award-winning Kes Gray and the winner of the Roald Dahl Funny Prize, Jim Field, comes an hilarious counting picture book about our four-legged – and two-legged and eight-legged – friends! How many legs would there be if a polar bear came for tea? How high would the leg count go if a squid rode in on a buffalo? As more and more animals join in the fun, count along if you can!